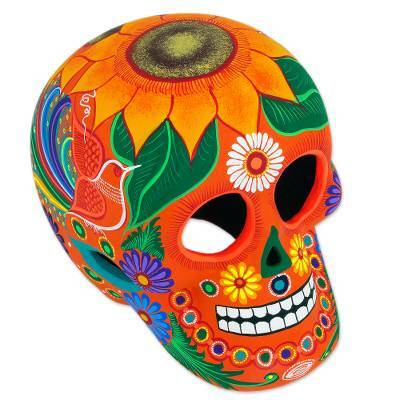 Floral Ceramic Day of the Dead Skull Sculpture from Mexico, "Friendly Skull"
The Mexican concept of the calavera, or skull, mocks the spectre of death with a colorful celebration of life. Eufrosia Pantaleon creates a whimsical Day of the Dead skull with vacant eyes and a toothy grin. Crafted of ceramic, the piece is hand-painted in festive colors with flowers and accent leaves. You can find ceramic sculpture 'Friendly Skull' by Eufrosia Pantaleon in sculpture categories such as Halloween Sculpture and Ceramic Sculpture. Enjoy exploring these sections for other Novica treasures.